When it comes to a wedding budget in Las Vegas everyone has one. Do not think that you can not afford the beautiful wedding you have dreamed of. You just have to put your wedding desires in perspective. When it comes to putting things in perspective, we as wedding photographers believe that once it is all said and done the only thing you will have after your honeymoon is the memories that your photographer(s) have captured for you. It is all important but you must put things in the order or importance. We have found this simple break down that was featured on The Knot. They have wedding statistics that have years of research behind them. Here's a basic breakdown of what you can expect to pay: Reception: 48-50 percent Ceremony: 2-3 percent Attire: 8-10 percent Flowers: 8-10 percent Entertainment/Music: 8-10 percent Photography/Videography: 10-12 percent Stationery: 2-3 percent Wedding Rings: 2-3 percent Parking/Transportation: 2-3 percent Gifts: 2-3 percent Miscellaneous: 8 percent To avoid stress, allot 5 percent of your budget for a "just-in-case" fund. There are many ways to cut the budget and we will be more than happy to give you a few ideas. As a wedding photography company we cut your budget when we give you your quote from the start. We truly believe that you need to pass down your memories for future generations and would love for every couple to print an album. Sometimes with budgets we know that you may not be able to do that right away. 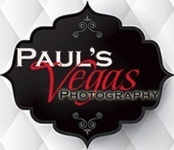 With Paul's Vegas Photography our price always includes your digital images to share at no extra cost. Here are a few other areas to cut if your budget does not allow everything. First decide what is important. Cut the guest list. Details can be very simple. Simple tables look just as beautiful. Choose the flowers you want as the bride they are in almost all of your pictures, bridesmaids only need something small. Tiers of cake are not needed to cut. Simple and small are just fine even at larger headcount weddings. We look forward to discussing all of your photography needs for your special day. But know that we are more than happy to give you options that work with your budget! Call us at 702-330-5838 and come see us at our new office in Henderson, Nevada.